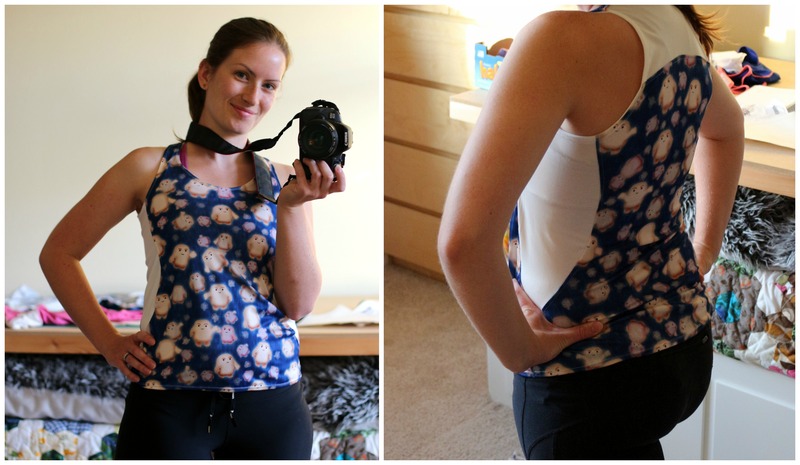 I had planned to not leave this until the last minute, but my first stretchy project didn’t pan out (a bamboo jersey knit version of the Scout tees I made the other week – too big and saggy!) and is currently sat in the corner thinking about what it has done, and so this was project number 2, something I have been planning to do for a while. ..a North Face workout top. I liked the style and cut of it, curves are added in using the side panels, giving a comfy yet flattering top. 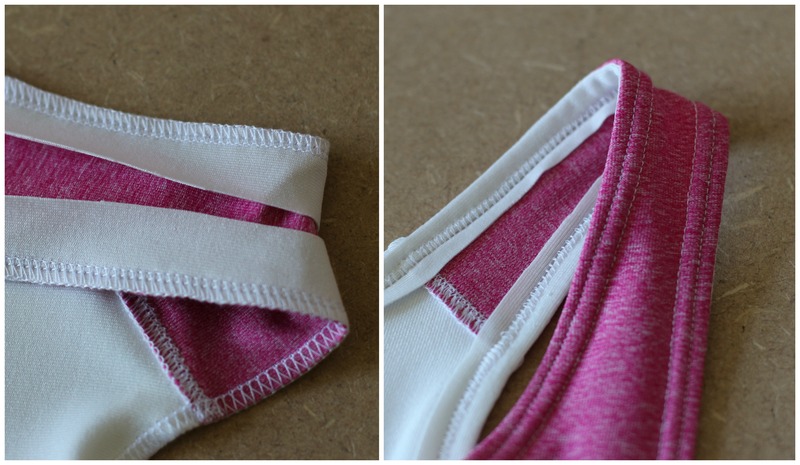 So of course I wanted to make another, and thought it would be just the challenge for Sew Stretchy! So first to the nitty gritty: to make the pattern, I just laid out the original on top of some paper (big roll of standard paper that they sell to go with the easels they sell in Ikea), and marked out each piece along with seamlines. 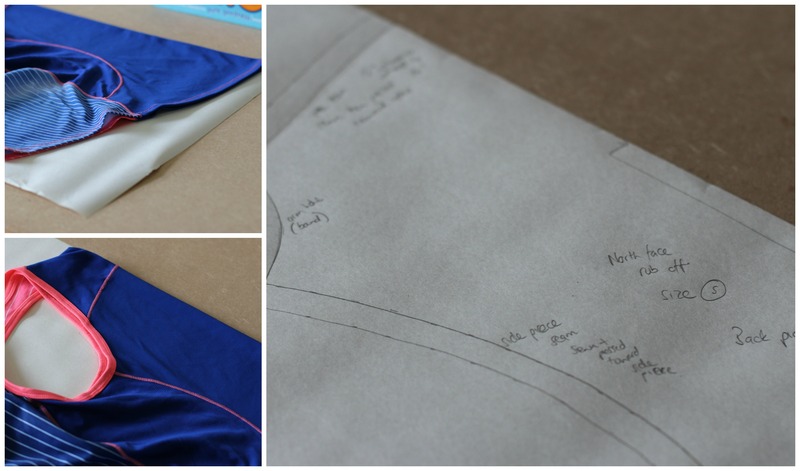 Next adding the seam allowance to each piece, and making notes on the construction, ie. sew this piece to this first, this seam pressed this way etc. Next I made a test top, using some technical knit fabric from Joann. I experimented with seam finishes a little bit, I wanted to use my overlocker, so that the edges didn’t fray and the seams had a little stretch, but also wanted the seams to lie flat. In the end I ended up overlocking, then sewing them flat just with straight stitch. Not the most beautiful of edges, but it worked well, stabilising the edges, and not pulling it out of shape too much. Any Whovians amongst you will recognise these little guys as being Adipose, fat brought to life after people take a “diet pill” provided by the alien Miss Foster in “Partners in Crime”, which then just walks away…….. 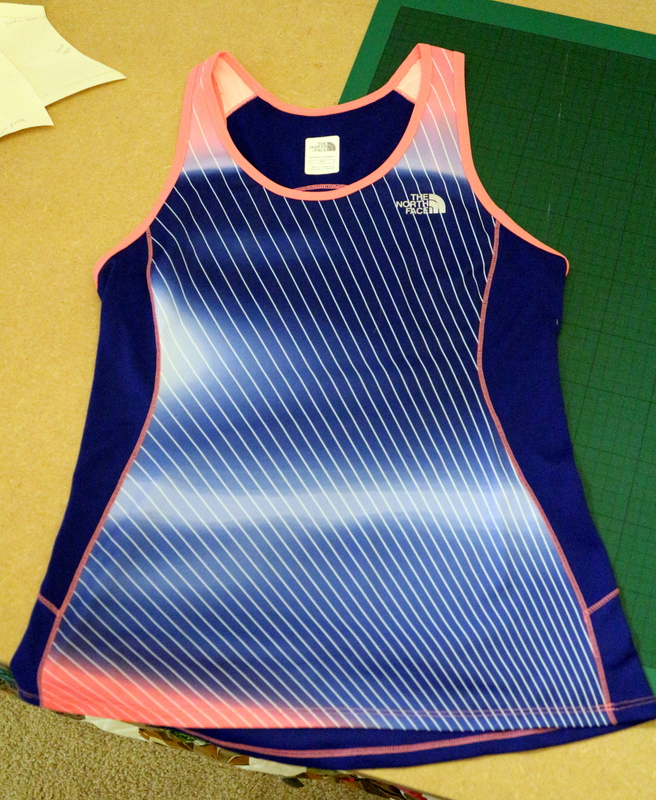 I just couldn’t resist the irony of having a top made for doing energetic physical activity out of fabric printed with basically…. fat. Haha! On the original, and on my test top, the seams were pressed and sewn towards the side panels, but I found that as this fabric was less stretchy, the seams were puckering like crazy. 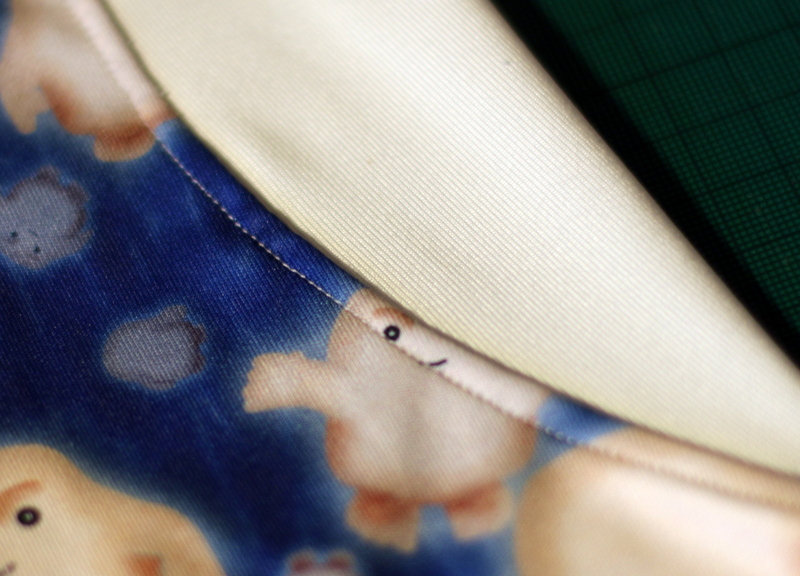 Instead, by having them the opposite way round, beautiful flat seams were achieved! …..and I had planned to take some more proper pictures, (perhaps even outside!) 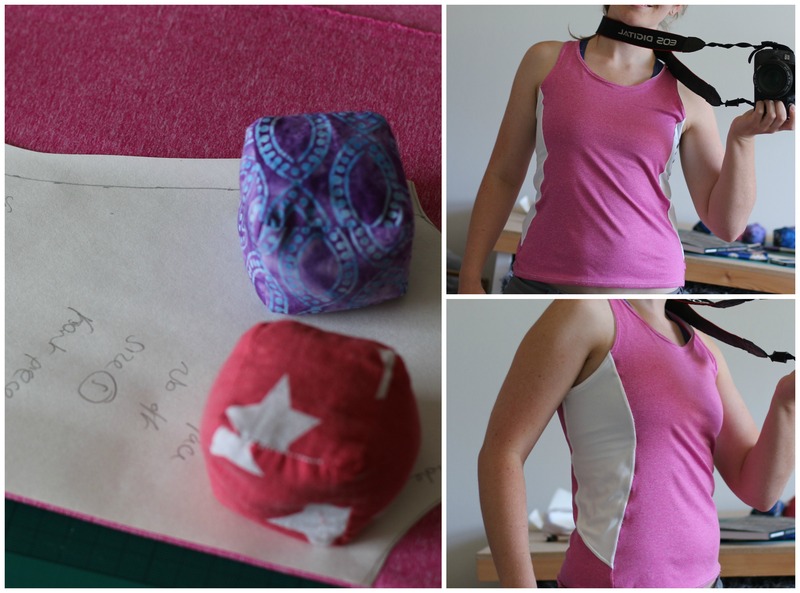 but I didn’t have time, so here are some action shots in the sewing room! I love the way it came together, I think it looks good with the white, and the adipose are super cute. What do I not love? 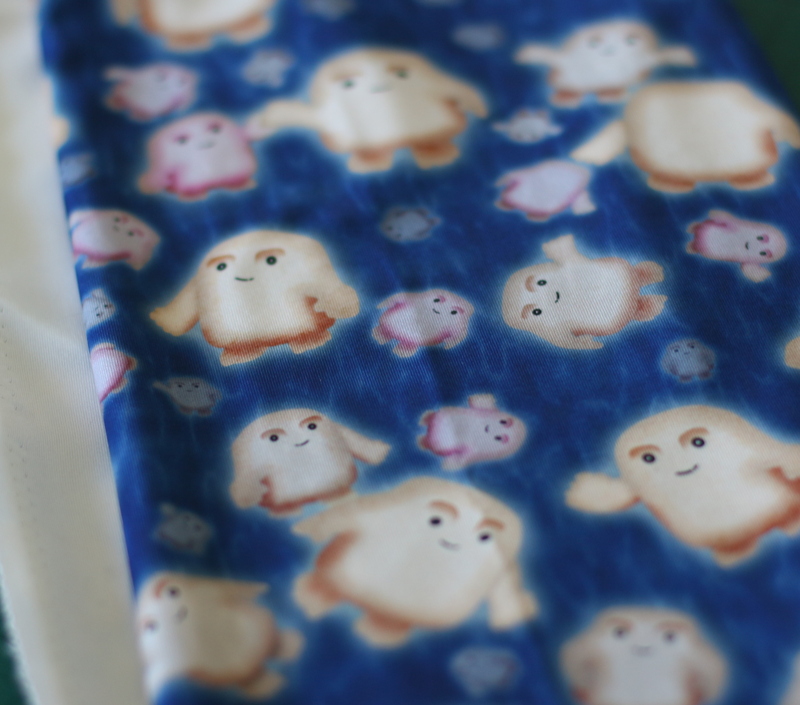 The spoonflower fabric! The print is vibrant and fun, but the fabric itself is a bit annoying. It has very little stretch, which puts pressure on the seams while taking it on and off, so where it has been stitched, the holes are threatening to tear! Wahhhhhh! This could be because I need to use different needles, but for the time being, as the seams are stitched flat, this is taking some of the pressure off them, so hopefully will keep it happy for longer! Meanwhile I shall investigate different needles, I shall not abandon you Adipose! ..happening over at Did You Make That! They ARE adipose! I thought they were when I saw your post on The Monthly Stitch, so I had to come here to make sure. I love that this fabric exists and I think it’s utterly brilliant to use it for workout clothing. UM this is amazing and hilarious!! Nice job!! Shame about the quality of the fabric though! I don’t even like to LOOK at spoonflower, everything is so expensive yet awesome! I know how you feel! I just had to indulge for the sake of the adipose! So clever and imaginative! Thanks for taking part in the Sewathon. ← Baking for guests: Gluten-Free Banana (and Chocolate Chip) Cake.